In 1989, Abdullah Öcalan was captured and charged with murder, extortion, separatism and treason; his death sentence was commuted to life in prison because of EU regulations. He started to study and write in prison, and began to seriously rethink the role of the state. 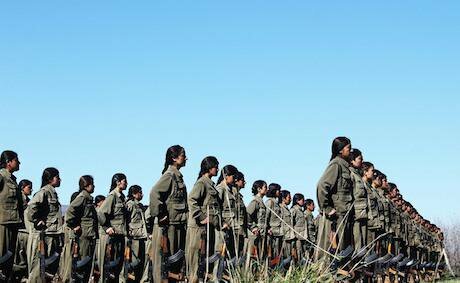 In his 2005 Declaration of Democratic Confederalism in Kurdistan, as well as his writings on women, he laid out a theory that is a complete break with the Leninist playbook. Today the Kurdish liberation movement argues that nation-states are intrinsically hierarchical, ethnically based, and sexist; and that rather than seizing the state apparatus, a liberation movement should be involved with the state only to the point of insisting that it be democratic and permit autonomy; beyond that, the movement should focus its energy on developing democratic economies and local self-governance based on anti-capitalist, feminist, and ecologically sound principles.